Nacházíte se: Booktook.cz → Odborná literatura → Cizojazyčné → Vnitřní lékařství → Clinical Skills, 2nd Ed. Clinical Skills, Second Edition, is a practical and comprehensive guide to history taking, examination, and interpretation of results for medical students, junior doctors, and nurse practitioners. Written with wit and clarity, and packed with illustrations, this book will teach you how to join the dots between signs, symptoms, and diagnoses. This textbook sets out invaluable routines for the examination of each system, and includes chapters on interpreting chest x-rays and spot diagnosis. Over 500 line drawings and colour photographs give practical examples of core and advanced examination skills. Throughout the text, key points and tips dispense essential wisdom, while case studies help you to put theory into practice. 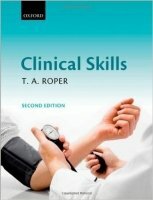 This new edition of Clinical Skills is now more useful than ever in your preparation for finals. Each chapter ends with a short set of assesment questions and a section on how the system in question is tested in OSCEs. Even better, the chapter on finals has been expanded and updated to give more practical advice than ever before. Written in plain English and designed to demystify even the most daunting procedures, Clinical Skills, Second Edition is the ultimate all-round textbook to help you hone your skills and prepare for finals.